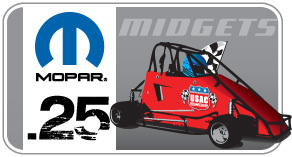 It’s getting late in the summer and many kids are reluctantly planning for the upcoming school year, but USAC MOPAR .25 Midget drivers are still looking forward to “Generation Next” race events. The Little Hoosier 100 Track is going in on Monday at the beautiful youth facility called Newton Park in Lakeville, IN. The park was built by the Hoosier Tire Family and is maintained to impeccable excellence. The portable wall system has been transported from Milwaukee to Indianapolis and now to Lakeville. This is the 3rd year that Hoosier has hosted this event. Nolan Allison set a goal this season – to finish up in points in the National Series. Even though “Generation Next” Series Championships are calculated on 5 race events, this is #6 for the Allison Family. Just 3 weeks after the “Brickyard at the Brickyard”, the Allison’s, the Burton’s, the Miller’s and the Stanley’s, will make the 1300 mile round trip trek to Lakeville, Indiana. This is after racing the North Carolina Summer Series on Tuesday night and the NC Club Series on Saturday. Grampa Fred Turner is one of the boys biggest fans. The Turner Family has been in racing for years. Fred started at 16, he drag raced, he raced cars for other people, raced in the Daytona Dash Series, fielded Busch Series Cars and he owned Ace Speedway for 10 years. Michelle was just 8 years old. To say the Allison’s are racers is an understatement. Nolan says his biggest competition in Senior Honda is Jared Irvan. Currently Nolan sits 3rd place in that class while holding 7th in Light 160 and 12th in Light World Formula. Neal and friend (and fellow competitor) Ryan Israel are ranked 3rd and 4th in Junior Honda National Points. “The boys just spent the night together,” laughs mom. Thursday begins practice (noon - 5 pm) for Round 10 of the 12 race USAC MOPAR “Generation Next” Series. One round of practice and Heat Races begin on Friday morning with Semi’s to follow. "Our drivers will be able to watch MOPAR D1 Midgets, Ford Focus and Ford Focus Young Guns events at Plymouth Speedway on Friday night," said Developmental Director, James Spink.